I found a recipe for Honey Bread and Butter Pickles in Canning for a New Generation and decided to give it a try. I’m reluctant to continue to call these pickles bread and butter pickles since they’re missing one of the key components I generally associate with bread and butter pickles – the sweetness factor. I actually doubled the amount of honey called for in the recipe. They were still not what I would consider sweet, and I tend to have a fairly low tolerance for sweet. The recipe still turned out a wonderful pickle, it’s slightly different from a traditional dill, and has the additional bonus of not containing any cane sugar. I also didn’t bother with canning these pickles, although, this recipe is perfect for canning if you want to put in the extra work. I simply decided to save some time and store then in the refrigerator for up to a month, and gift a few jars. Buckwheat Honey is our central ingredient for this recipe. While some may question our choice of honey on this recipe, we picked it because Buckwheat Honey is known for its depth of flavor. You can use Buckwheat Honey for all sorts of savory recipes and we think this is a great fit! Enjoy! September is National Honey Month and it seemed fitting for us to celebrate. Not only because we have a pretty sweet line of honey jars, but also because we’ve been enjoying honey sweetened preserves and all the benefits of swapping honey for sugar in our jams, fruit butters and other preserves. If you haven’t tried using honey in place of sugar in your preserves, this post about honey sweetened preserves offers some guidance on how to do that safely. We’ve also learned a lot about the addition of honey, and tried many trusted recipes from the books Naturally Sweet Food in Jars, and Preserving with Pomona’s Pectin. This recipe is adapted from Marisa McClellan’s recipe for Gingery Fig Butter in her book Naturally Sweet Food in Jars. Prepare jars, lids and a boiling water bath canner and 5 half-pint/250 ml jars. Note: You don’t need to peel these pears. The natural pectin in the skins helps thickening. And adds flavor and nutrition. When you puree the pears (with the skins), you’ll find the skins just disappear into the butter. 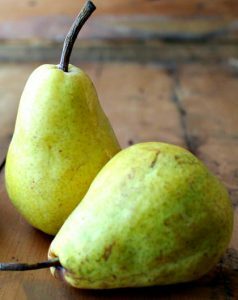 Combine the pears, honey, lemon juice, and ginger in a low, wide, non-reactive pot. Place over high heat and bring to a boil. Once the contents of the pot begin to bubble and roll, reduce the heat to medium-low. Using an immersion blender, puree the warm pears until smooth. Cook, stirring regularly until the pear puree is thick. You know it’s done because it begins to thickly coat the sides of the pan and offers more resistance when you stir. During cooking, the pear butter may have clumped up a bit. If this is the case, use your immersion blender to puree is smooth again. Remove the pot from the heat and funnel the finished butter into the prepared jars, leaving 1/2 inch/12 mm of headspace. Wipe the rims, apply the lids and rings, and process in a boiling water bath canner for 15 minutes. Monica King here to kick off National Honey Month since I’m a beekeeper. This awareness month was initiated by the National Honey Board in 1989 to promote American beekeepers and honey. One pharoah, Cleopatra, used honey in her beauty regime. One of Cleopatra’s secrets, and her most famous, was her ritual bathing in milk and honey. Both of these ingredients naturally soften the skin, exfoliate, and leave a fresh, sweet scent. You can do this yourself by adding two cups milk and half cup honey to your bath water. Personally, it is Cleopatra’s sweet tooth that I can relate to. Cleopatra’s favorite treat was a sweet honey ball called “Dulcis Coccora” also known as “Tiger Nut Sweets.” A recipe was reported to have been found on a broken piece of Egyptian pottery dating from 1600 BCE. What’s Cooking in Gail’s Kitchen? Equal Measures: Honeycomb Cheese Wheel! Remember when you were a kid and for fun you puckered up with those candy red wax lips? Me and my girlfriends would put them on, batt our eyes, sashay our hips, and laugh hysterically. Most often we’d find ourselves chewing on the sugary insides before spitting them out into tiny red blobs on our way home from school. I’m sure that made quite an impression on the neighborhood boys. Well today’s honeycomb is a distant cousin, twice-removed, to those artificial candy lips. Even better, raw honeycomb is completely safe to eat and naturally sweet. A little goes a long way simply because it is seeping with honey. Dress it up with a wheel of Camembert or Brie cheese, seasoned with a clove of garlic and a couple of sprigs from the herb garden. Spread it across baguette slices for an open-air treat. Do you enjoy simple dinners that are healthy and tasty? One of my favorite meals is Honey chicken toast because it is a great meal on a busy day. This meal is perfect for one person or a whole family. My favorite honeys to use on this recipe are; alfalfa clover and the plain whipped honey from Honeyville. I switch between two different honeys depending on my mood. These are nice and sweet; which is complemented by the salt sprinkled on top. This dish is perfect for sparking your taste buds. Don’t take my word, try it out for yourself and see what the buzz is all about. And for your busy days, here’s an easy dinner, done in about 30 minutes. It’s full of citrusy flavor with just hint of sweetness. A little mixed rice, a bright salad and it’s dinner! What’s Cooking in Gail’s Kitchen? A Burst of Flavor: Balsamic Reduction Sauce-It’s Sweet! This is the elegant dark sauce you find drizzled over salads, cheese, meats, vegetables, and even fruity desserts in restaurants. At home, it can be made in minutes. You’ll feel like a master chef when you swirl it over your favorite dishes. I do. HONEY – BALSAMIC REDUCTION SAUCE-IT’S SWEET! Growing up, my dad regularly made stir-fry using bags of frozen stir-fry vegetables, whatever meat seemed like a good idea, and little else. As a result, I never really liked stir-fry. After moving out on my own, I attempted my own stir-fries, with fresh vegetables and complicated concoctions of soy sauce and citrus juice and sesame seeds and whatever else seemed like a good idea. I still did not like stir-fry. It turns out I actually never really knew what I was doing. Recently, I have returned to stir-fry thanks to The Supper of the Lamb, by Robert Farrar Capon (which I reviewed here). Capon explains that the joy of the stir-fry is in simplicity and speed. A hot skillet or wok, just a few vegetables, a little meat and a little sauce is all that’s needed. It turns out I actually do like stir-fry, as long as I don’t mess it up. We are so excited for BBQ season; it is such a great time to get together with friends and family! One of my favorite dishes at any summer party, picnic, or BBQ is potato salad. I can never get enough and there are so many ways to make it different. From using different potatoes to using a vinegar for the dressing; potato salad can come in so many flavors! I really love adding O’Hara’s sweetwater draw honey dill mustard, but definitely try their other AMAZING honey mustards too! I’m always on the look-out for “healthy” hundred-year-old cookie recipes, so I was thrilled when I came across a recipe for Honey Wafers. The recipe uses honey as the primary sweetener – though it does contain a small amount of sugar. Old-fashioned Honey Wafers are delightful with coffee. They have a distinct honey flavor, with mild undertones of lemon. Don’t expect these cookies to taste like sugar cookies. I used a 2-inch in diameter round cookies cutter when making these cookies. This was a good size. Small is better. The honey is very predominant, and made for savoring. These cookies got relatively hard after a day or two, but were still good. They could also be softened by putting in an airtight container with a slice or two of apple. It’s still berry season here in South Carolina. Time to enjoy lots of sweet delicious strawberries! It’s finally berry season again and I couldn’t be more excited. I LOVE berries. I eat a yogurt parfait almost every day and I need fresh berries in it to make it feel complete. I buy berries all year long, even when they are out of season and way too expensive. I know I shouldn’t or at least buy the frozen berries. But there is something about a juicy, ripe fresh berry I cannot resist. The frozen just aren’t the same. Now that berries are back in season AND on sale. Well, naturally, I did a little happy dance at the store. ….and I created this delicious new breakfast treat. My husband and I went out to eat at Texas Roadhouse and thoroughly enjoyed their warm rolls with the Cinnamon Honey Butter so I thought I would make my own. I love cinnamon and this butter is excellent on things like French toast, pancakes, toast, sweet rolls, dinner rolls…. well you get the idea. This can be made up in a matter of minutes and then placed in the refrigerator for a few hours and it’s ready to go! Once more, dietary changes are forcing cooking and baking changes. Some results are rather dreadful. Others have proven to be quite good! So it was with this cheesecake. No sugar, no gluten. The biggest problem was finding the dry curd cottage cheese. also known as hoop cheese or farmer’s cheese. I found the cheese at the local Whole Foods, and neither my husband nor I had ever tasted it – but we did, and liked it. It is a rather dry cheese, not sweet or salty, with a bit of a curd, but very fine, like ricotta. The original recipe is from this blog, but I changed it so that I made one 8″ cheesecake, instead of 4 individual ones. The only thing beside pan size that I changed was the baking time. You just can’t beat fresh honey! It’s great for so many purposes but we especially love it in recipes! These baked chicken tenders turned out great. Full of flavor and just delicious! In large bowl, mix flour and panko together with salt and pepper. In another large bowl whip together BBQ sauce, milk, eggs and honey. Dip tenders in BBQ/milk (wet) mixture and generously roll the chicken tenders in the Panko mix. Place the chicken strips on the baking sheet. Bake for 10 minutes. Flip tenders over and allow it to bake until cooked through and outside is crisp, about 10 minutes. Cook chicken tenders longer if you want more brown. Serve with the Honey BBQ Dipping Sauce (below). To make the Honey BBQ Dipping Sauce, combine the BBQ sauce and honey, stirring together until fully mixed. Tip: Spray tenders with non-stick cooking spray to help them crisp up better. The bread recipe of the week are these lovely buttermilk dinner rolls. They are light, solidly formed, and subtly flavored by honey and lemon zest. I added some sprouted wheat flour to the mix for some additional protein, but, if you do not have any on hand, feel free to use regular flour, or substitute in another whole grain flour. Keep in mind that the density of the flour will effect the lightness of the rolls. Some may say that cheesecake is food of the gods—those people include the ancient Greek Olympians, who feasted on a flour cake filled with cheese and honey after their pentathlon competitions. The ancient Greeks were already aware of the connections between physical aptitude and lifestyle choices—and the athletes engaged in a variety of restrictive diets believed to enhance their performances, such as xerophagia, a diet consisting of dry foods. Like the modern-day cheesecake, the ancient Greek version was an indulgence, something you pair with your wine at the end of a languid feast. In 250 BC, the Greek poet Archestratus wrote a gastronomic travel guide called Life of Luxury that is only preserved in fragments. In one piece that has survived, he makes mention of the dessert: “Yet accept a cheese-cake made in Athens; or, failing that, if you can get one from somewhere else, go out and demand some Attic honey, since that will make your cheesecake superb.” But, alas, he did not include any recipes. As with the classical sculptures we now find in museums, we can thank the Romans for preserving the Greek cheesecake into posterity. De Agri Cultura, Cato the Elder’s 160 BC farming manual, is not only the earliest example of surviving Latin prose, but a glorified food blog—it includes not one but several recipes for cheesecakes. “Cato is a proud Roman, writing in Latin,” Cathy Kaufman, food history and author of Cooking in Ancient Civilizations, explained over email. “Nonetheless, there seems to be an overlap between Archestratus’s gastronomic descriptions and Cato’s recipes.” The only possible difference between an ancient Greek cheesecake and an ancient Roman cheesecake, classicist and food blogger Andrew Coletti added, is that the early Greeks didn’t use chicken eggs. Cato’s cheesecake recipes include a sweet version called savillum and a savory cheesecake called libum, the latter being related to our modern-day word, libations. “They were often made as religious offerings,” Coletti explained. These were simple baked mixtures of baked cheese and flour that could be eaten with a spoon. Another more complex version from Cato, the placenta cake, involves layering cheese, honey, and dough together and flavored with bay leaves. According to Coletti, black poppyseeds were also used as cheesecake toppings. Think of them as ancient sprinkles. I love everything in this recipe. Fruit, cream, honey, roasted nuts. What’s not to like? Tropical and seasonal fruits, dry fruits are used. Dressing is done with fresh cream and honey. Here I present fresh and juicy fruit salad with honey n cream dressing to relish during festive days or anytime. Njoy Cooking, Serving n Savoring! Just in time for game day! Wings are fun, festive, quick to make and delicious. Perfect as apps before your holiday party or as a simple dinner paired with mashed potatoes and salad. When my family last bought a batch of local chicken, we picked up six fresh whole chickens and cut them into parts before we froze them — ziplock baggies of breasts, thighs, wings, legs and leftover bones/parts — each destined for different dinners. It was a fun shakeup from the whole chickens we typically make. And it gave us enough wings to pull off this dish. Whether you’re getting your wings locally or no, the honey, spice and yogurt combo make these hard to resist. Feel free to double the recipe for twice as much goodness. Appetizer platter made for the Mid-State Beekeepers annual holiday potluck. This year my contribution to the local beekeeping holiday dinner was an appetizer platter featuring this year’s comb honey. The honey was from my yard here and made using the Ross Rounds system. It seemed well received and was cleaned up by the end of dinner. As pictured, Comb honey sitting atop cream cheese, green seedless grapes, blackberries, blueberries, Townhouse Focaccia Tuscan cheese crackers, Triscuit Fig and Honey crackers. I love autumn, the season when the leaves turn red and the farmer’s market close to me is abundant in winter squashes. Butternut squash is available to buy for most of the year (in supermarkets), however some of the more unusual varieties of squash only appear at this time of the year. It is worth looking out for them in farmer’s markets and of course they taste fabulous roasted with honey (as are honey roasted carrots). Honey roasted squash is a simple and easy to make side dish and below is a quick recipe. The cooking is mostly hands-off, and the prep is easy! Have you noticed; when you make a switch to something your taste buds just won’t let you go back? I used to love store bought cookies and when other people made cookies. Until, I tried this recipe. Now no matter what I try to eat, it just tastes way too sweet for me. I really love this recipe because you can add little things to make it taste different. I also like that I can freeze them so if I am not in the mood to make them, I have some ready! However, they never last long enough in our house. I really have a bad habit of eating them for breakfast too! My friends know I love Egg Nog. I look forward to seeing it being offered in the stores each year. Enjoy this recipe by epicurious.com on making homemade Honey Egg Nog. Eggnog is a wonderful rich festive drink, something of a dessert in a cup and much more indulgent than mulled wine. It doesn’t have to be made with spirits, so you can make a non-alcoholic batch for the kids and the designated drivers. But it’s better with the rum and brandy! I recommend using one of the heather honeys as they work well with spice. In the bowl of an electric mixer, dissolve the honey in the water. Stir in the light rum and brandy thoroughly. Beat the mixture, gradually beating in the egg yolks, the milk, and the cream. Beat the eggnog until it is foamy and serve it in individual glasses with a dusting of grated allspice, nutmeg or ginger. As the recipe contains raw egg it is unadvisable for those whose immune system is less strong. We don’t recommend giving it to small children, the elderly, pregnant women and those with a low immune system. These are a great crispy and flavorful potato recipe that keeps you from slaving over a stove or oven to make. It may be fall where I live, but the weather is more like summer, so I have been trying to avoid using my oven as much as possible. These are made on the grill so they would also make for a great side dish to any cookout meal. What’s Cooking in Gail’s Kitchen? Simple Sensations: Honeycomb Sweet Bee! Raw honeycomb has the most incredible flavor concentrated with the sweet nectar of wildflowers. The first time I tasted it, with a crisp apple slice and a nibble of sharp cheese, I realized what all the buzz was about. This edible mystery is a conversation-starter at every gathering. And a little goes a long way. Store honeycomb at room temperature in a covered container.